On Thursday January 10, 2019 the Shoreline School District and PTA celebrated its young artists who had participated in this year’s National Reflections PTA Art Contest. A well-attended open house reception was held for the artists and families at the Shoreline Center. There were 166 entries total in 6 categories including: visual arts, photography, film production, music composition, literature and dance. There were artists representing each school in the district. 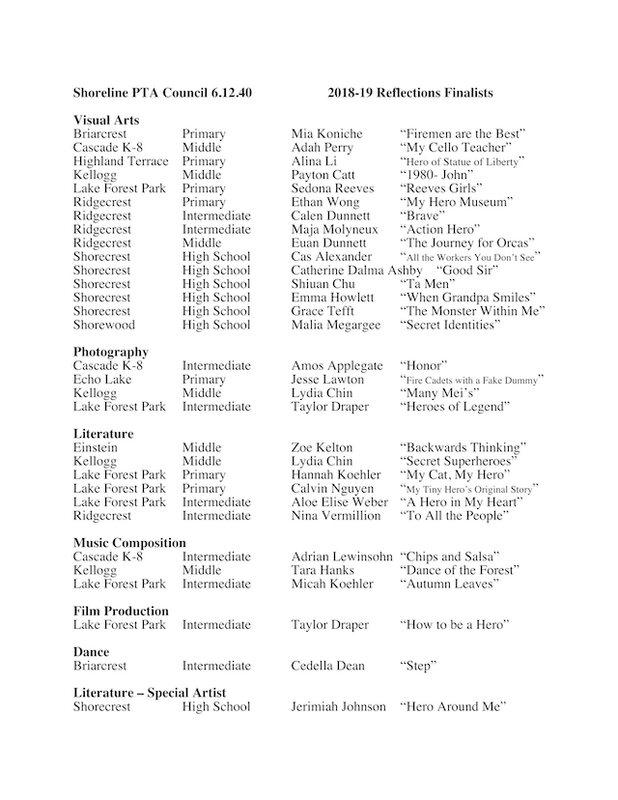 District level winners were announced, with 31 finalists, and 25 honorable mentions. The finalist pieces will now move on to the state level competition. Thanks to all who work to bring the opportunity for art expression to our local students through the Reflections program!